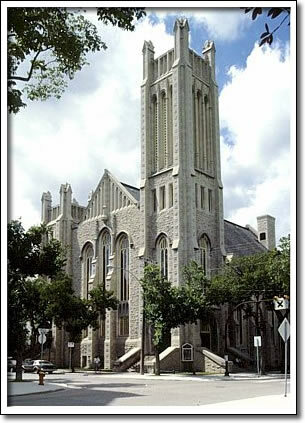 Knox United, originally a Presbyterian church, is the largest United church in Manitoba. Constructed between 1914 and 1918, it was also the pinnacle of Protestant church architecture in the province. The building is the design of J.H.G. Russell (1862–1946), a prominent Winnipeg architect also responsible for two other important United Churches, Augustine (1903–04) and Westminster (1911–12). Knox was created with reference to the Late Gothic Revival style. With its powerful verticality, smooth surfaces and subdued ornament, it is a magnificent exponent of that style. Finished at the height of World War One, the church was one of the last great building projects undertaken in Manitoba during the Edwardian era.